There are few factors that you should keep in mind before you give your ceiling fan the maintenance it needs. If your fan is made of metal or plastic, it is obvious that there is very little maintenance required. The electrical motor is something that is beyond your ability to maintain. At the most, you can lubricate it on a regular basis, balance it when needed and do some dusting. Beyond that, every maintenance task will have to be done by an expert. The fan head to which the blades are attached will be opened only when there is something wrong with the bearings or the mechanism of the unit. Even then, the repairs and maintenance should be done by the expert. Hence, the maximum that you can do, in terms of maintenance, is cleaning the fan on a regular basis. A well dusted and clean fan is always going to function efficiently. On the other hand, if you ignore this fact, your fan will soon look very dirty. Nobody likes the site of a dirty and grubby looking device swinging around. The design of the blades is such that the dirt starts accumulating near the edges. As time goes by, the dirt goes towards the center. The moment the entire blade is covered in dust, it will start spew dust all over the room every time you switch the fan on. It is not very difficult to dust the fan. You can easily overcome the height problem by making use of a long brush. You can also use a chair or a ladder to get close to the fan so that you can wipe it clean with your hands. The latter option is preferable because you will have a better view of the blades. However, this also means that you will need somebody to help you out because it is not a good idea to stand on a tall ladder that reaches close to the ceiling without anybody holding on to it. In any case, you should clear the area surrounding the ladder so that you do not fall on some other object and hurt yourself badly. If you are planning to go in for a long brush, make sure you go in for two brushes. You can use one to keep the blades in place as you use the other to clean the blades. This is important because the fan can start rotating and this will make it very difficult and dangerous for you to get a good grip. Furthermore, you may use excessive force and cause the fan to swing and may even cause the blades to twist. All this can be avoided if you hold the fan in place. It can be a good idea to simply take the fan down from the ceiling for thorough cleaning. If you choose that way, the tools required to dismantle the ceiling fan and bring it down are the same. You will need a pair of pliers to remove the metal pin that is pushed into the screw. You don’t need a spanner that will unlock the screw even as you hold the bolt with the help of the pliers. Once this is done, you just need to lift the fan slightly and remove the screw and bring it down. You might need another spanner if you intend to dismantle the ceiling fan head away from the rod. You will need a screwdriver to remove the screws that connect the blade to the ceiling fan head. If you intend to carry out maintenance activities, you should complete the entire task in a single stretch. If it is just a question of dismantling the fan and cleaning the same and lubricating it before fitting it back, you can carry out maintenance activities on each, and every fan fitted to your house without any difficulty. On the other hand, if it is a question of carrying out repairs, then you should keep it separate so that you can work at it some other time. Have in mind that the chances are remote that each and every fan in your house would need repairs simultaneously. Hence, you just have to keep those fans needing repair apart and lubricate and reinstall those fans that are ready to be fitted. It is advisable to have somebody help you out when you are dismantling and removing the fan whether it is simple ceiling fan or remote one. This may not be a very difficult task but can quickly become laborious because you would be operating at a height and would be required to focus on your safety even as you hold the fan. The fan may not look very heavy but is certainly bulky when you have to hold it with a single hand. In such a scenario, if you have somebody to hold you by your side, you can grab the fan with both hands and bring it down properly. Make sure you have all the necessary consumables in your hand. There is no point in running around searching for the right lubricant to use after you have dismantled the fan. You should have all these components in your hand well in advance. Although it is recommended that you ask somebody to assist you with the maintenance process, you can carry out the procedure yourself. However, below are few points to help you avoiding the most common maintenance mistakes. Now that you have removed the fan from the hook and you are holding it in your hand. You move your hand and try to hold it from the top rather than holding the ceiling head. You have to make sure that you do not lose the grip. Otherwise, the fan hits the ground hard. The ceiling fan head houses the motor and is a most important part of the fan. If this crashes into the ground at high speed, you can rest assured that the motor will be damaged. Keep in mind that even the slightest distortion in the casing is sufficient for the motor to malfunction. Either the motor will start making a lot of noise or the lack of space will result in overheating and even a fire. If you have dropped your ceiling fan, it is advisable to hand it over to the expert for a professional checkup. If you have brought your ceiling fan down safely, make sure that there is sufficient clearance on all the sides until you remove the blades. Do not place your fan in such a manner that the blades are pushed forcefully against any other object. You would notice that the blades are very pliable and can easily be bent. You may feel that you can easily unbend the blades later. However, once the metal blade is bent, you can rest assured that you can never be brought back to its original position. If you want to avoid such a complication, you should make sure that the blades are completely straight and do not face any obstruction whatsoever. If you do not have sufficient space, you can ask somebody to hold the fan vertically so that you can simply unscrew the blades as quickly as possible. However, do not make the mistake of placing the blades heavily against any object. Also, do not place anything on the blade even though you are keeping the object very close to the top. Even the slightest distortion can make your fan useless. Thirdly, do not make the mistake of ignoring the electrical connections when you are removing the fan. Take a look at the connection and keep track of the exact color coding. You should follow it to the last letter when you are reinstalling the fan. As long as you do not need to deal with the electrical motor, maintaining your ceiling fan should be an easy task. It is important that you dust the blades on a regular basis to maximize its performance. 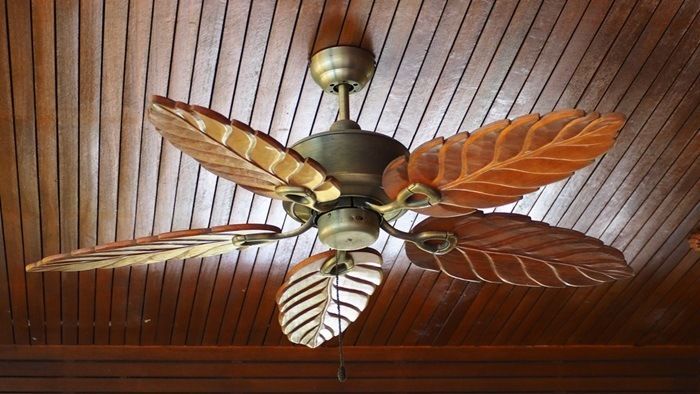 Dirt and dust can affect the efficiency of a ceiling fan. Therefore, it is essential that you keep the blades clean to get the most out of the air circulation in the room. For the motor, your best option is to call in an expert, even if the motor just needs lubrication. Copyright © 2019. Created by Ceilingfancomparison.com.